Due to a high rate of transient human papillomavirus (HPV) infection, HPV genotyping has a low specificity for high-grade cervical lesions, especially in young women. p16/Ki-67 dual immunohistochemical staining can also be used for the detection of oncogenic changes in cervical cells. Our aim was to compare the performance of p16/Ki-67 dual staining and HPV genotyping in the detection of high-grade cervical lesions in patients with atypical squamous cells of undetermined significance (ASCUS)/low-grade squamous intraepithelial lesion (LSIL) on Pap smear. We retrospectively analyzed 310 patients with ASCUS/LSIL on Pap smear, who underwent colposcopy. Among these, 161 patients with suspected lesions detected by colposcopy were referred to biopsy. HPV genotyping by LINEAR ARRAY HPV Genotyping Test (CE-IVD) and p16/Ki-67 dual staining by CINtec PLUS Cytology kit was performed prior to cervical biopsy. The overall sensitivity and specificity of HPV genotyping for the detection of cervical intraepithelial neoplasia (CIN) 2-3 was 79% and 72%, respectively in patients with ASCUS, and 85% and 64%, respectively in patients with LSIL. For p16/ki-67 test, sensitivity and specificity rate was 66% and 93%, respectively in ASCUS and 59% and 79%, respectively in LSIL group. The specificity of p16/Ki-67 staining was significantly higher in both groups in patients aged <30 years compared to patients >30 years old (p < 0.001). Our results showed that p16/Ki-67 dual staining has a higher specificity compared to HPV genotyping, especially in patients under 30 years old. This indicates the usefulness of p16/Ki-67 testing in the triage of patients with ASCUS/LSIL and <30 years old, prior to the referral to colposcopy and biopsy. Sawaya GF, Grimes DA. 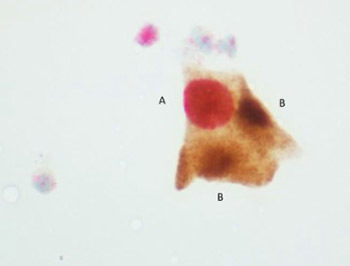 New technologies in cervical cytology screening: a word of caution. Obstet Gynecol. 1999; 94(2):307–10. Saslow D, Solomon D, Lawson HW, Killackey M, Kulasingam S, Cain S et al. American Cancer Society, American Society for Colposcopy and Cervical Pathology, and American Society for Clinical Pathology screening guidelines for the prevention and early detection of cervical cancer. Am J Clin Pathol. 2012;137(4):516–542. Bergeron C, Ikenberg H, Sideri M, Denton K, Bogers J, Schmidt D et al. Prospective evaluation of p16/Ki-67 dual-stained cytology for managing women with abnormal Papanicolaou cytology: PALMS study results. Cancer Cytopathol. 2015 Jun;123(6):373-81. doi: 10.1002/cncy.21542. Epub 2015 Apr 17. Possati-Resende J C, Fregnani JH, Kerr LM, Mauad EC, Longatto-Filho A, Scapulatempo-Neto C. The Accuracy of p16/Ki-67 and HPV Test in the Detection of CIN2/3 in Women Diagnosed with ASC-US or LSIL. PloS one. 2015, 10(7), e0134445. Moleriu RD, Zaharie D, Moatăr-Moleriu LC, Gruia AT, Mic AA, Mic FA. Insights into the mechanisms of thymus involution and regeneration by modeling the glucocorticoid-induced perturbation of thymocyte populations dynamics. Journal of Theoretical Biology. 2014 Jan 28;348C, pg. 80-99. Singh G. Determination of Cutoff Score for a Diagnostic Test. The Internet Journal of Laboratory Medicine. 2006 Volume 2, Number 1. Pirtea L, Grigoraş D, Matusz P, Pirtea M, Moleriu L, Tudor A et al. Human Papilloma Virus Persistence after Cone Excision in Women with Cervical High Grade Squamous Intraepithelial Lesion: A Prospective Study. Canadian Journal of Infectious Diseases and Medical Microbiology, vol. 2016, Article ID 3076380, 6 pages, 2016. Massad LS, Einstein MH, Huh WK, Katki HA, Kinney WK, Schiffman M et al. 2012 ASCCP Consensus Guidelines Conference. 2012 updated consensus guidelines for the management of abnormal cervical cancer screening tests and cancer precursors. Obstet Gynecol. 2013 Apr;121(4):829-46. Bansal N, Wright JD, Cohen CJ, Herzog TJ. Natural history of established low grade cervical intraepithelial (CIN1) lesions. Anticancer Res. 2008;28:1763–6. Vrdoljak-Mozetič D, Krašević M, Verša Ostojić D, Štemberger-Papić S, Rubeša-Mihaljević R, Bubonja-Šonje M. HPV16 genotype, p16/Ki-67 dual staining and koilocytic morphology as potential predictors of the clinical outcome for cervical low-grade squamous intraepithelial lesions. Cytopathology. 2015 Feb;26(1):10-8. Palla VV, Karaolanis G, Moris D, Antsaklis A. Sentinel Lymph Node Biopsy in Uterine Cervical Cancer Patients: Ready for Clinical Use? A Review of the Literature. ISRN Surgery. 2014, Article ID 841618, 6 pages, 2014. Bălu S, Pirtea L, Gaje P, Cîmpean AM, Raica M. The immunohistochemical expression of endocrine gland-derived-VEGF (EG-VEGF) as a prognostic marker in ovarian cancer. Rom J Morphol Embryol. 2012, 53(3):479-83. Grigoras D, Pirtea L, Ceausu RA. Endothelial progenitor cells contribute to the development of ovarian carcinoma tumor blood vessels. Oncology Letters. 2014;7(5):1511-1514. Pirtea L, Raica M, Cimpean AM. Endothelial cell activation and proliferation in ovarian tumors: two distinct steps as potential markers for antiangiogenic therapy response. Mol Med Rep. 2012 May;5(5):1181-4. Klaes R, Friedrich T, Spitkovsky D, Ridder R, Rudy W, Petry U et al. Overexpression of p16(INK4A) as a specific marker for dysplastic and neoplastic epithelial cells of the cervix uteri. Int J Cancer. 2001;92:276-284. Wentzensen N, Schwartz L, Zuna RE, Smith K, Mathews C, Gold MA et al. Performance of p16/Ki-67 immunostaining to detect cervical cancer precursors in a colposcopy referral population. Clin Cancer Res. 2012;18:4154–62.